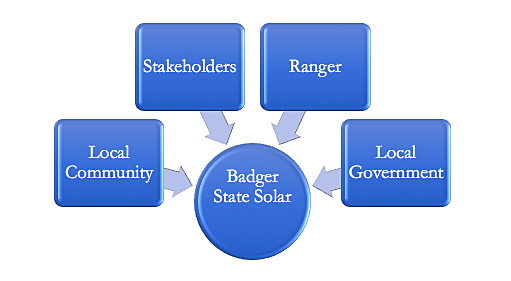 Ranger Power is pleased to present the Badger State Solar Project, a 149 MWac solar photovoltaic generation facility located on privately owned land in Jefferson County, Wisconsin. The Project will provide clean, American-made power to over 20,000 homes while also providing significant economic opportunities to the local community. Restoring soil health and structure with grass cover crops and minimal soil disturbance over the life of the project. Reduced fertilizer, herbicide, and pesticide use. Reduced stormwater runoff and erosion by improving soil infiltration. Efficient long-term storage of nutrients. Improvement of downstream water quality. At the end of the project life, land will be returned to its previous condition, effectively preserving the land for future agricultural use. Income diversification for local farmers improves resiliency while protecting and preserving agricultural land for future farming generations. Over $500,000 expected in annual revenue compared to the $20,000 in property tax revenues collected in 2017 from the land under lease for Badger State Solar. Hundreds of jobs created during the constructions phase and 3-5 full time jobs once the project is operational. Ranger’s community outreach plan utilizes a partnership approach. Ranger invites town leadership, local business groups, environmental organizations, labor unions and other identified stakeholders to learn the full scope of each project and the local, statewide and regional advantages. Empowering these communities as partners not only helps build support, it also helps set a positive tone for the regulatory review process. Ranger Power is here to provide you with more information and answer any questions you may have. Ranger works to share project information with and gather feedback from neighbors, local business and community leaders, environmental and other special interest organizations, labor unions and other interested people. We believe that sharing information, listening and adapting is part of our responsibility and helps build a project that communities can support.